Ha, yesterday evening I was in an portrait drawing mode again.. An good idea came up in my mind: Why not drawing facebook friends? I posted an update that was something like 'Suggestions on drawing a portrait tonight? 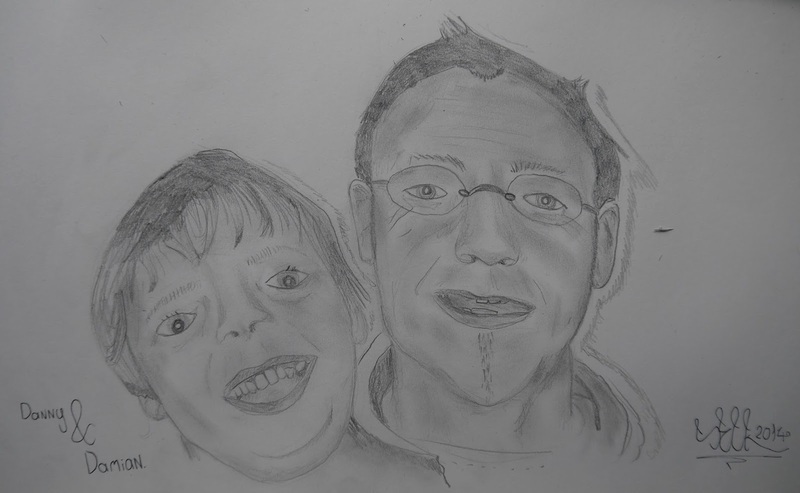 You could ask if I like to draw you but don't complain when your face is on my blog a couple of days later hahaha.' The amount of comments were.. huge. More than 8 people already.. Damn. Thats a lot of work to do! I think i'll make a series of this, every day that I have some spare time, I will draw one of you guys that are interested and tag you on facebook. Stay tuned if you commented! I started yesterday with the first message, first come first served you know. Danny didn't have that many high-quality pictures on his page, so I just picked one and made my own composition. I saw a picture of him with his son, Damian. I know them from a soccer club that's for kids with autism, and the trainers (Danny is one of them) are all doing it to help another human. Really nice! Autistenvoetbal also has a page on facebook, they are even playing against other clubs now. Keep it up guys. Thanks for letting me portrait you! It's an honour!